Make a killing with Unibet’s Free Bonus Money that can see you pocket five-figures in winnings! Place smart bets on the ATP World Tour Finals and get a piece of a whopping £15,000 Free Bonus Money Prize Pool. Make pre-match or live bets on any of the matchups during the course of the tournament to collect points and progress up the leaderboard for a bigger piece of the pie. The more you bet and higher your standing will be on the chart, which translates to higher percentage of the £15,000 Free Bonus Money! Just make sure to bet on the best players; only winning bets count towards the points total. This is a limited time offer, so collect all the points you can until November 20 to scoop the lucrative Free Bonus Money. Note: Action Betting bets (singles only) will see you rewarded with double points, allowing you to maximize your points total. The leaderboard is updated every day at 16:00 during the promo campaign, so check back regularly to see what your standing is at the moment. Amount staked on the event x number of events on the bet slip x total odds on the bet slip = total points. Placing a £10 wager on the triple bet that carry odds of 5.50 will give out 165 points in total (10 x 3 x 5.50 = 165). Andy Murray recently overtook Novak Djokovic as the World’s No.1, and he started off his ATP World Tour Finals campaign with a solid win over Croatian Marin Cilic 6-3, 6-2 last night. Murray is the favourite to win the tournament 2.15 (23/20), while Djokovic – who has relinquished his No.1 spot after 223 weeks – is right behind him with odds of 2.45 (29/20). 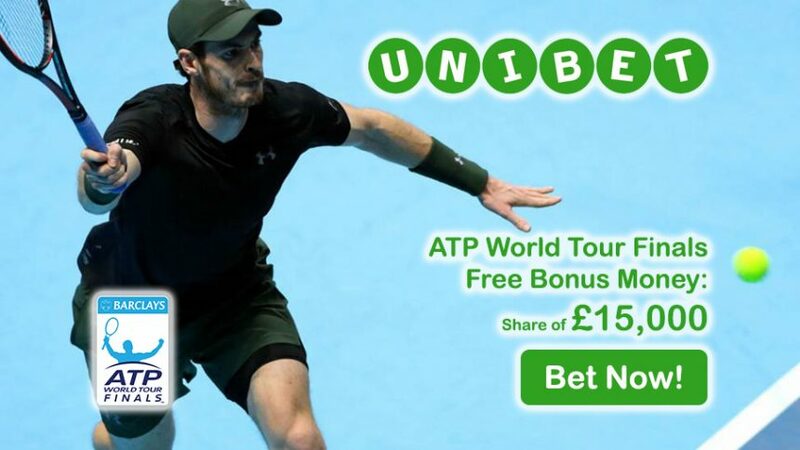 Get your hands on the £15,000 Free Bonus Money before other players by making the best bets on the ATP World Tour Finals! Win £15,000 Free Bonus Money!